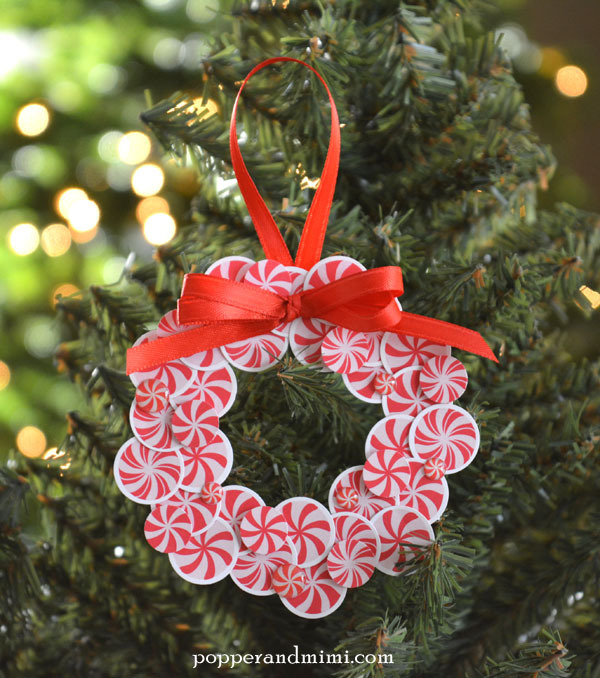 Mini Wreath Ornaments - Pebbles, Inc. I love looking at thematic, color coordinated Christmas trees, but nothing brings me as much joy as the hodge-podge of handmade ornaments that adorn our family Christmas tree. Each one brings back sweet Christmas memories. Every year I add to the mix by making new handmade ornaments. Inspired in part by a broken embroidery hoop I had laying around in my craft room, I decided to make mini wreath ornaments this year. Holiday wreaths come in a wide variety of themes and can be made out of just about any material. 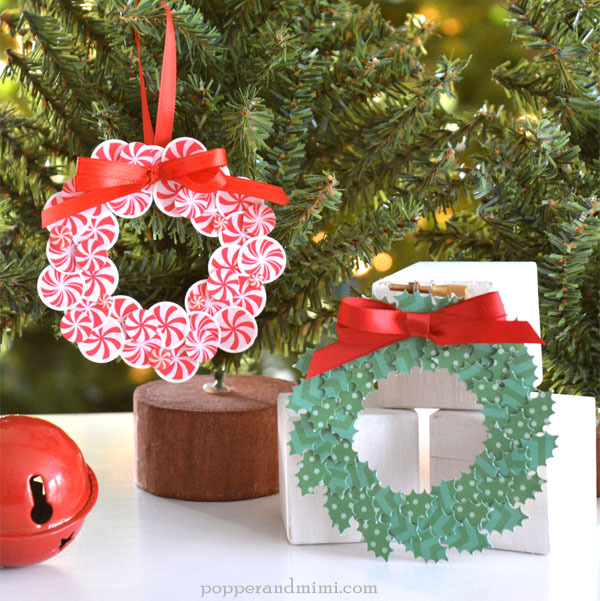 I had some fun with patterned paper from the Home for Christmas collection and put together a couple of mini wreath ornaments for the Christmas tree. 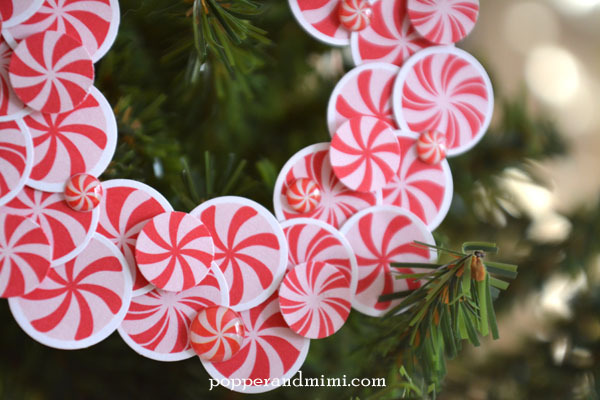 I am a sucker for red and white striped peppermints. 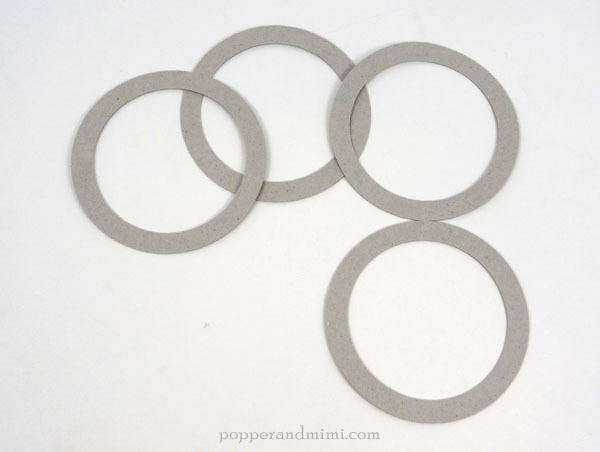 Using regular ol’ circle punches (3/4″ and 1/2″) I punched out several peppermints from a sheet of 12″x12″ paper and adhered them to a DIY wreath base (below). I adhered a satin bow and made a loop by adhering a piece of ribbon to the back of the ornament. 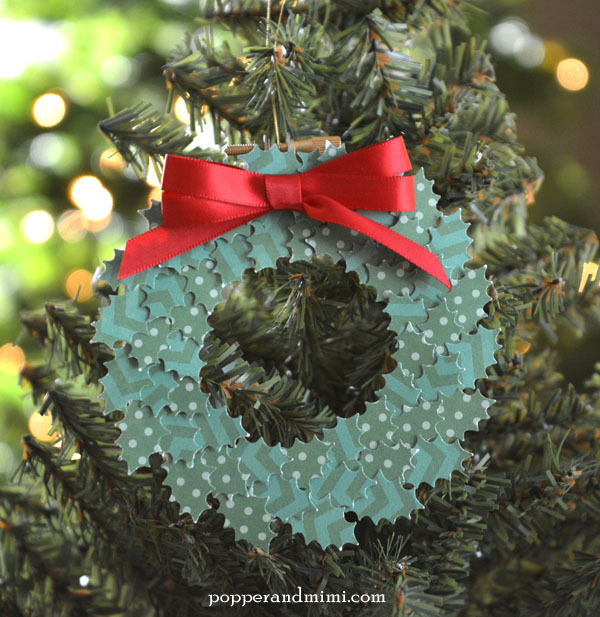 I added some texture and dimension to the wreath by popping up the smaller punched peppermints with foam. And although I had fully intended to save them for “later”, I also added some peppermint enamel dots. Aren’t they yummy? 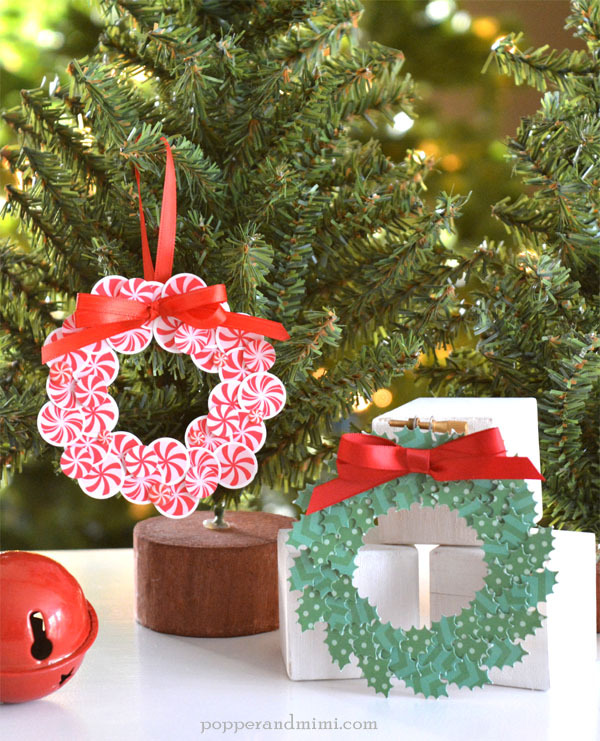 If you don’t have a mini embroidery hoop to use as your ornament base, die cut several rings from chipboard and adhere them together to make a sturdy wreath base. So easy. Having made full-size paper leaf wreaths before, I thought it would be fun to shrink everything down and make a mini paper leaf wreath ornament. 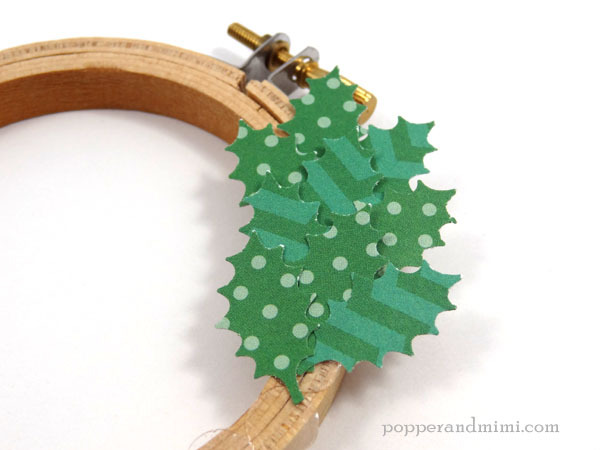 I simply punched a bunch of holly leaves from patterned paper and adhered them to an embroidery hoop. Voila! After gluing the broken embroidery hoop back together, I affixed glue dots around the hoop in small sections. Starting near the top of the hoop, I adhered the leaves to the glue dots, making sure to vary the orientation of the leaves as I went along. Don’t forget to add a pretty bow.